It’s that time of year…again. When honors are given out and people feel snubbed and hackles get raised. Critics get on their high horse and tell the collective voters what they did wrong, and in doing so, how certain people were wronged. There is no shortage of soapboxes, and there is certainly no shortage of ink spilt about what the right choices were, that we need to fix the system, and how we need to be better next year. It’s essentially a January rite of passage. But enough about the Oscars. Let’s deal with important matters – a museum in Central New York that houses the greatest to ever play the game, as well as a few others. The festivities kicked off in December, when the Today’s Game Committee voted to induct Harold Baines (as well as Lee Smith) into the Hall of Fame. That’s right. In case you were not paying attention, a guy who never received more than 6.1% of the BBWA vote was chosen to have his plaque in the hallowed first floor Gallery. Suffice it to say, there was much pearl clutching about this decision. There were countless articles written asking if Harold Baines, then why not ______ (fill in your favorite player); and how allowing Baines in lowers the bar and thus dilutes the exclusivity and specialness of the Hall of Fame. Hell, my boyhood idol – Will Clark – was thrown around as deserving of induction if the likes of Harold Baines can get the call. It used to be 3,000 hits punched your ticket, but the PED era upended that assumption. Baines collected 2,866. 500 homeruns was another key threshold. Baines had 384. His career OPS of 121 is 340th on the all-time list, tied with Jason Bay, Jeff Burroughs, Ron Cey, and Cecil Cooper. Not exactly a list of Hall of Fame hopefuls. He did make six all-star appearances and won the Silver Slugger Award in 1989 (at DH). So he has that going for him. In short, Baines should not be making reservations at the Otesaga Hotel in mid-July, but he will be. Yesterday, the results of the BBWA voting were released (it’s hard to understand why they don’t coordinate the Today’s Game Committee vote with the BBWA vote, but considering all of the other issues with this process, that seems like the smallest nit to pick). Lost in the ballyhoo of Mariano Rivera being the first unanimous inductee was a former third-baseman turned designated hitter who made it to Cooperstown in his last year of eligibility. This, of course, was not lost on the denizens of Seattle, who have spent countless hours in the Kingdome and T-Mobile Park (née Safeco Field) lobbying for Edgar Martinez’s induction. For a baseball town that has suffered many slings and arrows, Tuesday was a banner day. And yet, the question resounds: Is Edgar Martinez Hall-Worthy (h/t to Elaine Bettis). He is right on the edge, but when put into the proper context, he makes the grade. When you look at the above lists, it’s hard to justify not having Edgar in the HOF. As I stated above, it’s close, but Edgar deserves to give a speech in July. Since Baines got in last December, and leading up to yesterday’s announcement, living in Los Angeles, I have heard the following question numerous times: If Harold Baines is a Hall-of-Famer, and Edgar Martinez is a Hall-of-Famer, then isn’t Steve Garvey a Hall-of-Famer? Now, for some of you, that is a name you have neither heard nor thought of in quite some time. For others, his name evokes “Not My Padre” bumper stickers. But for many, those of you donning your #6 jerseys at Chavez Ravine, you are taken back to that perfect chin dimple, that mop of wavy brown hair, that slick glove, and that ever-so-clutch bat. The true fans can still see his golf swing outside the batter’s box, and his pigeon-toed stance inside it. We all remember the hand above his head as he rounds first base in a Padres uniform in the end credits of This Week in Baseball. For many of you, the answer is yes, sure, of course; if Baines and Martinez are in the Hall, you think, then my man Garvey certainly deserves to be enshrined. Garvey never got more than 42.6% of the BBWA vote while he was HOF eligible. He did win the 1974 NL MVP, which gives him one more MVP than Baines, but he never won a Silver Slugger Award. Winning four Gold Gloves seems impressive, but when you consider the NL first baseman of his era, I don’t think Tony Perez or Willie Stargell or Pete Rose provided much defensive competition. And once Keith Hernandez joined the league, Garvey’s reign was over. So there you have it. Edgar is in because he earned it. Garvey is not because he didn’t. And Baines somehow got in because his former manager (Tony LaRussa) and former owner (Jerry Reinsdorf) were on the committee that chose him after-the-fact. 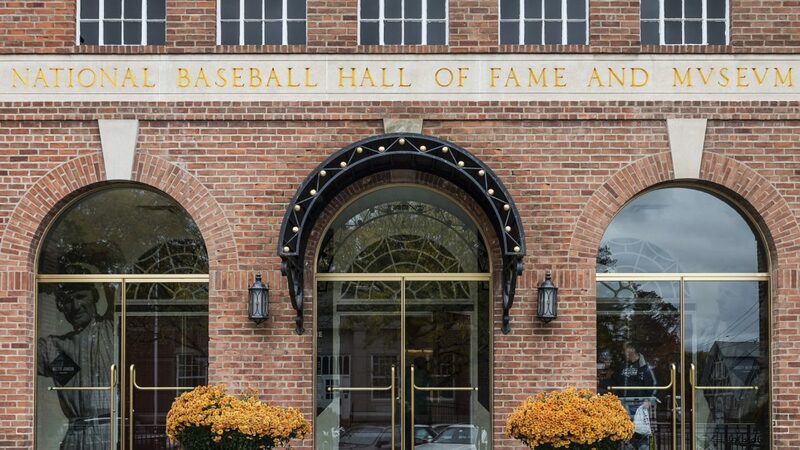 But, at the end of the day, the Hall of Fame is still an incredible place; it remains a bucket list destination for any true baseball fan; and – warts and all – it still represents (nearly) all of the best our favorite game has to offer.